In State v. Gonzalez, the WA Court of Appeals decided there was sufficient evidence that the defendant attempted to influence a witness to testify falsely where he asked the witness to give a different story than the one she told the police. The defendant Leonel Gonzalez was in a relationship with Nona Hook for several years. Hook lived with her mother, Carol Salyers, and several other family members, and Gonzalez was frequently in the home. Salyers owned a Jeep and permitted Hook, but not Gonzalez, to drive it. he had taken her Jeep. According to Hook, Gonzalez denied knowing anything about the Jeep, but he told her that he was “coming home.” At some point after this call, someone contacted the police. the police, Gonzalez drove away, jumped out of the Jeep while it was still moving, and attempted to flee on foot. The Jeep rolled into and damaged a parked vehicle. The police caught and arrested Gonzalez. Following his arrest, officers discovered a white substance that later tested positive for both methamphetamine and cocaine in Gonzalez’s back pocket. While in jail following his arrest, Gonzalez called Hook. This call was recorded. Hook responded by chuckling and saying, “That’s gonna be a little bit hard for me to do.” Gonzalez appears to respond, “Well, then don’t do it.” The rest of Gonzalez’s response is unclear. Hook replied, “I mean, for one thing, I was—you already know what the deal was.” And Gonzalez told her aggressively to “listen” and that they were not “going to talk about all that.” He then stated, “You know what to do, so.” Gonzalez and Hook then talked about when Hook could visit so they could talk about their relationship and whether they would marry even if he was in prison. During this part of the conversation, Hook commented about how hard it was for her to be away from him, and Gonzalez responded by asking her whether she “would rather deal with” 6 or 15 years. The State charged Gonzalez with theft of a motor vehicle, unlawful possession of a controlled substance (methamphetamine), hit and run, and tampering with a witness. At trial, Ms. Hook testified about the jail calls. Ultimately, the jury found Gonzalez guilty of unlawful possession of a controlled substance and tampering with a witness. Gonzalez appealed under arguments that the evidence was insufficient to support the witness tampering conviction because (1) he asked Hook to speak to his investigator and never discussed her testimony and (2) there was no evidence he was asking Hook to testify falsely. testify falsely because he asked her to tell the defense investigator only something different than she told the police. He asserts that speaking to the defense investigator is not the equivalent of testimony. “We disagree,” said the Court of Appeals. The Court reasoned that Gonzalez’s request that Hook tell the defense investigator a different story than she told the police would have little effect if it did not also imply that Hook needed to also be willing to testify consistently with what she told the defense investigator. “Thus, a rational finder of fact could have easily found that Gonzalez was attempting to influence Hook’s potential testimony,” said the Court. “Again, we disagree,” said the Court of Appeals. “At no point in her testimony did Hook testify that she had given Gonzalez permission to take the Jeep on September 18th,” said the Court. Instead, she testified that she dropped Gonzalez off, drove the Jeep home and parked it, and left the keys near the back door. Although Gonzalez came into her bedroom the next morning, Hook did not testify that he asked for or that she gave him permission to drive the Jeep. The Court of Appeals further reasoned that taking this evidence in the light most favorable to the State, the jury could find that Hook’s testimony established that Gonzalez took the Jeep without her permission and that Hook’s testimony was truthful. In sum, the Court of Appeals affirmed Gonzalez’s convictions, but remanded for re-sentencing on the unlawful possession of a controlled substance conviction consistent with this opinion. Excellent, informative article by Michael Shaw of in the Columbia Journalism Review discusses the clear double standard in the visual framing of the opioid crisis in comparison to the crack cocaine crisis of the 1980’s. Shaw claims that media coverage of the opioid epidemic—which largely affects suburban and rural whites—portrays it as an outside threat and focuses on treatment and recovery, while stories of heroin in the 1970s, crack-cocaine in the 1980s, and other drug problems that impact urban people of color today have focused on the drug user’s morality. “A sub-theme of opioid crisis coverage: Many stories showcase children who have been saved by loving grandparents.” Photo from The New York Times, 2016. Drug stories about black families in cities present a “narrative of broken homes, addicted babies, mothers depicted as unfit, the engagement of state agencies, and children routinely placed into foster care.” Photo from The Washington Post, 1989. The racial bias is inescapable. A drug crisis that is largely affecting suburban and rural whites is being treated with a drastically different attitude and approach in words and imagery than those used to characterize heroin use in the 1970s, crack cocaine in the late 1980s, and the drug problem plaguing America’s people of color and urban poor today. Shaw claims that elected officials, the criminal justice system, and the American media have adopted a “kinder and gentler” tone around the opioid crisis. 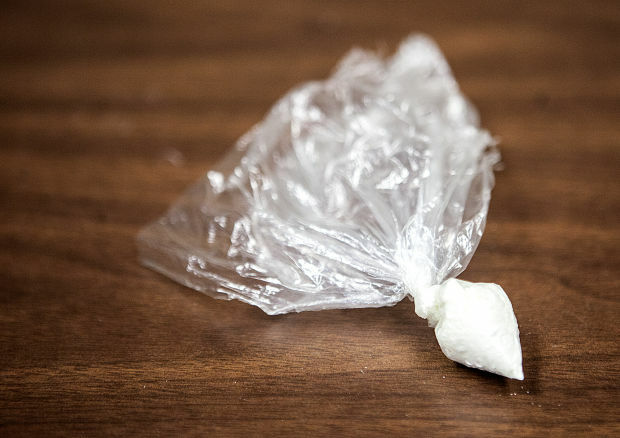 The attitude and phrasing of a recent New York Times article—titled: “In Heroin Crisis, White Families Seek Gentler War on Drugs”—is both an example and an illustration. As is Time’s just-published photo story “A caring lens on the opioid crisis.” The visual language is just as illuminating. The opioid crisis has been framed as a threat from outside, with drug users facing an “illness or a “disease” rather than a personal moral shortcoming. Shaw also argues that the largely white drug “epidemic” we’re facing now bears little resemblance to the scenes of squalor, sociopathy, and criminality depicted in this 33-photo Getty package shot in the Bronx and published in June. And photos from the urban “war on drugs” don’t look much different today than they did 30 years ago. The photo above by Scott Applewhite, also shot in the Bronx, appeared in 1989. It was published to illustrate an eight-week federal anti-drug initiative characterized by armed police raids on inner city crack houses. Suffice it to say police in general have taken a different approach to white opioid drug users (more on that later). Over the years, photographers have produced many landmark photo stories and bodies of work about drug addiction. The subjects and the settings have been uniformly harsh, the subjects primarily indigent and wayward, and the environs largely decrepit. Those stories include Larry Clark’s “Tulsa,” shot in the mid-1960s and published in 1971; Jessica Dimmock’s “The Ninth Floor,” shot in the Flatiron District of Manhattan and published in 2007; Michel Du Cille’s Pulitzer Prize winning work in 1988 documenting crack addiction in Miami. Another important photo story in the canon of addiction is Eugene Richards’s “Cocaine True Cocaine Blue.” The project was shot primarily in New York and Philadelphia from 1988 to 1992 and published in 1994. The Instagram post above captures the visual tone and sensibility of that historical investigation. Notice the difference in tone between the historical work and a opioid story in June in The New Yorker shot by Richards in one West Virginia county. This tweet depicts four of six Richards images that illustrated the story. In the top left photo, the girl playing in the yard lives with her grandmother. She lost her father to a heroin overdose. The top right photo shows people running a project that helps place addicts in rehab. The middle photo shows a mother, a recovering addict, showing off her newborn. And the last photo is a doctor who offers free public classes in the use of Narcan, the drug that reverses opioid overdoses. “What are the larger themes of photo coverage of the opioid crisis, centered on rural and suburban white America, and where do they contrast with coverage of drugs in cities?” asks Shaw. “Photos are almost always shot in color rather than the starker black and white. 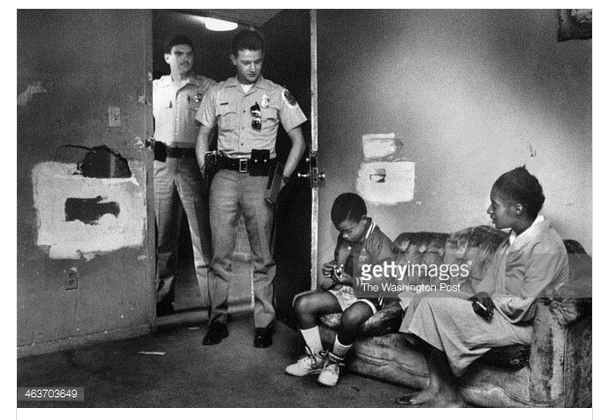 We typically see daytime or well-lit indoor photos, as opposed to night action on seedy streets or dark alleys.” Shaw further emphasizes that there is minimal engagement with courts, jail, or the police. 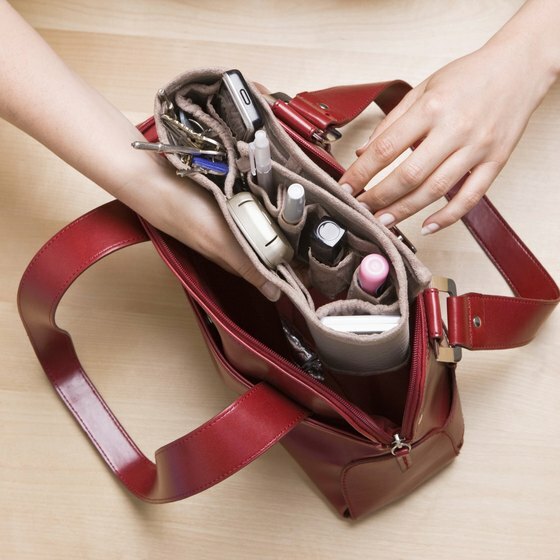 And there is a stress on domesticity. The photos often are shot at a home, the spaces mostly tidy or pulled together. Bedroom portraits are common. Opioid stories typically discuss family, extended family, and community. This image in the tweet above appeared in The New York Times “gentler drug war” story mentioned above. It’s a photo of Courtney Griffin, who died of a heroin overdose in 2014. The picture in the center show Courtney closely flanked by her sister and her mother. Emphasizing love and closeness, as well as nostalgia and irony, the photo exemplifies how the opioid imagery stays away from pain, despair, isolation, and, of course, relationship problems. Victims are often depicted in a sympathetic light, with an emphasis on family bonds and survivor grief. A sub-theme of opioid crisis coverage: Many stories showcase children who have been saved by loving grandparents. 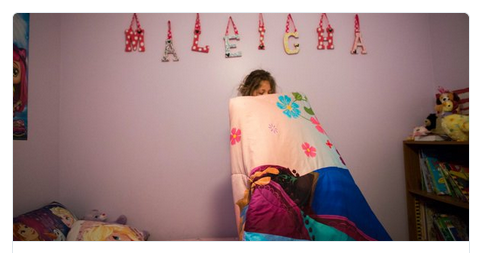 In the photo accompanying a Times story, notice the child safe in her bedroom, the letters on the wall spelling out her name, reinforcing identity and continuity. This pattern is a dramatic contrast to the narrative of broken homes, addicted babies, mothers depicted as unfit, the engagement of state agencies, and children routinely placed into foster care that is so characteristic of drug stories focused on black families in cities. This photo by Jahi Chikwendiu appeared in a Washington Post article highlighting a recovery house in Bowie, Maryland. Opioid stories consistently stress close-knit towns and support communities.This is a reunion picnic with residents, graduates, family members, and supporters. Of course, the bonding and intimacy in these photos obscure the alienation and the emotional isolation that go hand in hand with addiction. “The issue of responsibility is largely absent until the theme of recovery comes into play,” says Shaw. At that point, users and addicts are often shown exercising remarkable will and winning the battlewith the disease. Photos stress dignity, help-seeking, coping skills, and self-reliance in the face of poverty and other challenges. Consider this AP photo of a young man showing a picture of himself after a near-fatal overdose in 2015. It’s like it can’t be the same person, the Nike “Just Do It” accentuating a sense of agency over addiction. This photo was featured in a major article on the opioid crisis published this month by The New York Times Magazine. Faith, love, and patriotism are themes that often lace photos of the opioid crisis. In this photo, we see a look of conviction on the man’s face and an American flag in the background. This formerly homeless man started a wildly popular Facebook group after his friend died of heroin and is now a sought after drug counselor. What’s more American than bringing nationalism, patriotism, and a sense of can-do to a problem otherwise riddled with shame? When you do see photos of actual drug use, the images are typically clinical and objective, as opposed to desperate and dingy. After all the crafted photojournalism like the images you see above, it’s jarring to see these user pictures more in the style of stock photography. This photo by John Moore is part of a story about New London, Connecticut, which is suffering an unprecedented heroin and opioid pain pill epidemic. You’ll notice that the user wears a crucifix, a symbol of faith and a visual buffer with the drug use. Unlike other drug scourges, where photos of users using were common and showed faces, many opioid portraits hide the users’ faces. We hardly ever see anguish, craving, or the high, the rush, or the stupor. The subjects look as if they are doing a routine task, like brushing their teeth. Compare this to a frame from a story about New York City in May 2015 on the rise of synthetic marijuana, or K2, in New York City. The above photo by Spencer Platt shows a black male drug user unceremoniously splayed out on an East Harlem sidewalk. “Of course, there are exceptions,” says Shaw. This tweet captures several photos from a St. Louis Post-Dispatch story that the public found widely disturbing. Administration of heroin in most opioid stories is visualized in a casual way. In the unusual instance that depiction is blatantly graphic or inordinately casual though, a much stronger impact has been elicited. In this case, a couple is photographed shooting up at home, the woman six months pregnant. Beyond the act of administration, however, the rest of the imagery still conforms to many of the domestic norms described above. The February 6, 2017 photo was made in the kitchen, as the couple apparently prepared a meal. The place looks otherwise spotless; both wear clean clothes, and the dishes on the far counter seem to be washed. In the accompanying images by photojournalist David Carson, the drug use fits a larger routine. It might be a horror, but it’s a particularly antiseptic and contained one. In light of campaign politics and now the debate over healthcare, geography has been almost as prominent a theme in the opioid crisis as demographics. A great deal of the towns are down-and-out, suffering from poverty and a loss of industry. In many cases, however, the photography softens the blow. “The visual narrative around the opioid crisis has largely sidestepped criminality,” says Shaw. In fact, many opioid stories depict police as social advocates fighting for the community, as exemplified by the July New York Times Magazine cover story. In some cases, they are even a lifeline for users thanks to first responders who carry the drug Naloxone for reversing an overdose. Contrast this August 2015 arrest photo from East Harlem, the charges unspecified, (shot in this case by Spencer Platt for Getty Images), with the NYPD Instagram post below, from May. As a form of public service announcement, the two officers promote their use of Naloxone spray accompanied by an account of how they “saved a man from a potentially fatal overdose” just the week before. In fact, the visual stories hardly address the dealers and distributors of opioids at all. “I’m not sure what the race or ethnicity was of the person the NYPD rescued, but a thorough news image search reveals that most articles about Narcan or Naloxone either feature white drugs users or addicts, photos of white people who are being resuscitated (such as in this slideshow), or else they feature trainings or simulations with white volunteers and, almost exclusively, white mannequins,” says Shaw. “There is a clear double standard in the visual framing of the opioid crisis. Shaw points out that the gentler tone presents a marked departure from historical drug coverage, and the bias in the depiction of the problem as it plagues urban people of color feels “baked in.” Shaw further states that what is even more concerning is the prospect for closing this perceptual gap. Besides racial disparity in journalism, the dog-whistle politics of President Trump is encouraging divisiveness and driving a deeper wedge. Still worse, the GOP leadership is patronizing addicts and states with proportionally larger populations of afflicted rural white populations with the promise of increased prevention and treatment funding as part of its argument for repealing Obamacare. My opinion? Excellent way to bring truth to the surface. Thank you, Mr. Shaw, for shining light in the darkness. 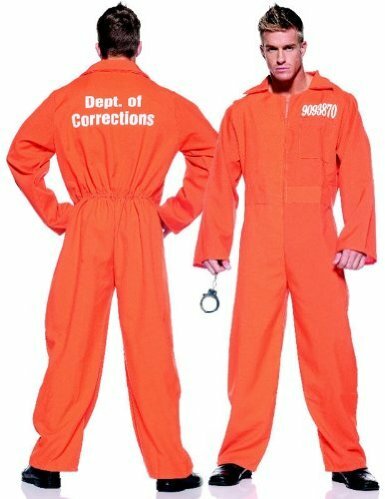 In State v. Caver, the WA Court of Appeals Division I decided a defendant’s constitutional rights were not violated when the court refused to allow him to wear jail clothing at trial. It does not prejudice a defendant to wear civilian clothes. The trial court denied Caver’s request, stating that “it causes much mischief if the defendant is clothed in regular jail garb.” The court explained to Caver that wearing jail clothes would cause the jury to speculate about why he was in jail and whether he posed a danger to them. The jury found him guilty. He appealed on numerous grounds to include arguments that the trial court violated his due process rights by not allowing him to wear jail clothes at trial. The court reasoned that although a defendant has the right not to appear in jail or prison clothing pursuant to Estelle v. Williams, these rights do not include a broad freedom for the defendant to express himself through his dress. Furthermore, although some Defendants sometimes choose to wear jail clothes as a trial tactic, it does not imply that defendants have a right to pursue this trial tactic. Consequently, the Court of Appeals concluded that the trial court’s decision was not inherently prejudicial and that the trial court did not abuse discretion. My opinion? Jail clothes make people look guilty. Period. That said, most defendants want to wear civilian clothing at trial. 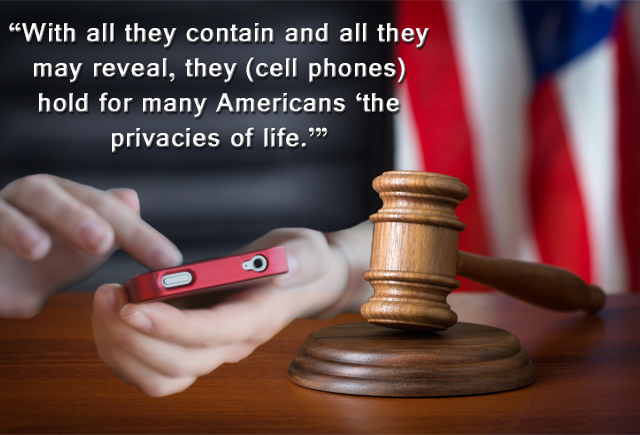 Looking “normal” – or at least not incarcerated – tells the jury the defendant might not be guilty of the charges.